Wifirst and Otrum join forces to offer an all-in-one connected TV solution to hoteliers. Wifirst is the leader in managed Wi-Fi for the Hospitality & Résidences market in France, whilst Otrum leads the way in TV management software for the hospitality industry. The combined Wifirst-Otrum solution includes dynamic management of the TV interface, Chromecast and access to content such as movies, TV channels and real-time information feeds. The complementary know-how of Wifirst and Otrum creates a harmonised guest-facing solution and at the same time facilitates the integration of WiFi and TV during the deployment phase. This partnership enables Wifirst to strengthen its range of connected solutions for hoteliers (WiFi, Fibre, Chromecast, IPTV) by offering a TV and Chromecast package, reaffirming the one-stop-shop offering for hoteliers. Wifirst relies on Otrum’s leading TV interface technology to facilitate the integration of its “Stream & Cast” solution. The interface is compatible with the main TV manufacturers on the market. In addition, the cloud-based SaaS Otrum solution offers the possibility to remotely manage Smart TVs to provide an exceptional customer experience. 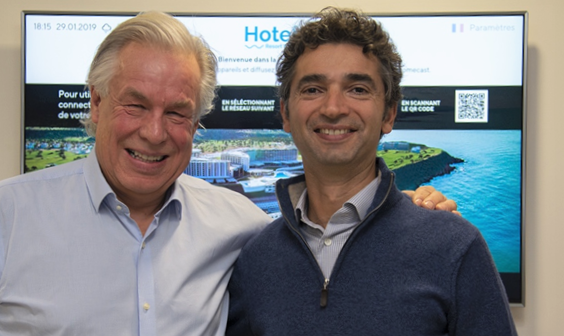 Otrum is present in more than 160,000 hotel rooms in Europe, the Middle East, Africa and Asia through a network of strategic partners, strengthening its presence in France with a first major project won by Wifirst. Otrum will accompany Wifirst in the deployment of 15,000 TV & Chromecast for the Appart’City Group, which manages more than 100 aparthotel residences in France, Belgium and soon Switzerland.